Operation Ariel – held on 5th July 2009 at Fearful Silence Airsoft site, Huddersfield. This site is around 30 acres of varying types of trees. It features open areas, thick undergrowth, fox holes, trenches and bases. As British and French troops organise evacuation to Dunkirk and Cherbourg it is left to the stout British infantry to hold back the German advance. A safe haven must be maintained, roads kept clear, equipment left behind put beyond use and extraction of French gold reserves facilitated. It’s grim work but hundreds of thousands of men’s lives depend on it. 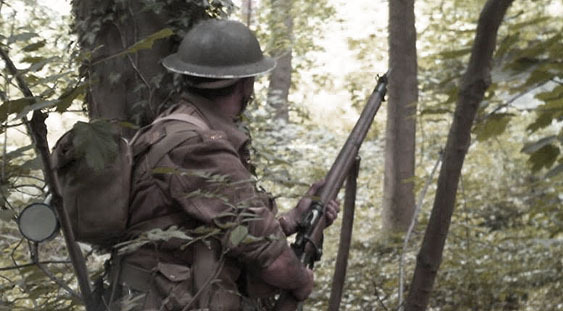 This event was the first early war event to be held in the UK and so was rather more prescriptive with required kit than normal which should gave much more of a feel for the days when sub-machine guns were a rarity and rifles were the norm. Once again lunch was provided in the field to add to the experience! What an awesome day! My thanks to everyone, the organisers did an outstanding job setting out the site, the site itself is excellent, the gameplay was outstanding, food was very very welcome, so was the break from carrying all that kit around! If ever a game subspended the disbelief it was this one. S.L.